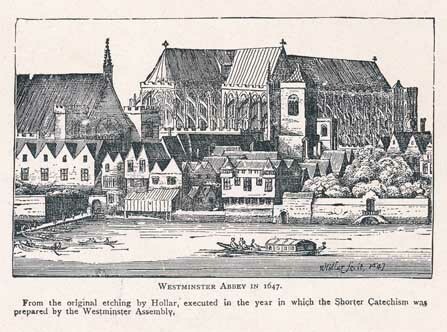 On this date in 1648, July 20th, the Westminster Larger Catechism was approved by the General Assembly of the Church of Scotland in Edinburgh, Scotland. Yet to countless Presbyterians today, the Larger Catechism is a forgotten creed in our churches. Yet it should not be. In the words of Professor W. Robert Godfrey, it is “a mine of fine gold theologically, historically, and spiritually.” (pg ix in his “Introduction to the Westminster Larger Catechism.”) It was always intended to be for the more mature Christians in the historic Christian faith, which certainly includes teaching and ruling elders, deacons, adult leaders in Christian education in the local church, and anyone else who may serve as a spiritual leader in the Church, or desire to be. 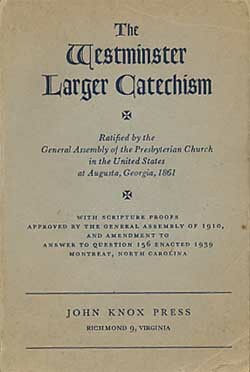 The value of the Larger Catechism, as outlined by W. Robert Godfrey in his introduction to the Catechism, is evidenced by its outstanding summaries of Biblical doctrine. I think of Question No. 77 which asks of the difference between justification and sanctification. In an examination by a Presbytery committee, this author was once asked the difference between justification and sanctification by a ruling elder! By God’s good grace, I had reviewed that answer just prior to the examination, and was enabled to answer it succinctly. Could you, the reader, relate its differences between these two theological doctrines? Larger Catechism Q. 77 informs you of the answer. The value of the Larger Catechism is also found in that some of its answers are superior even to the formulations of the Westminster Confession of Faith. The late John Murray believed this was the case with Q&A 30 – 32 on the Covenant of Grace, as being superior to Chapter 7, section 3 of the Confession. Too, the imputation of the guilt of Adam’s sin, as explained in L.C. 22 was superior to what WCF 6:3 says, the late Westminster Seminary professor believed. We cannot afford to be ignorant of the fulness of the Larger Catechism. Third, the exposition of the Ten Commandments is especially rich spiritually. It is true that “excessive elaboration” or overly-minute examinations of that which is commanded and forbidden of Exodus 20, tends to be a drag to countless readers and students. Yet Dr. Godfrey concludes “the Larger Catechism’s exposition of the law is in fact a useful basis for meditation and self-examination as it opens up the meaning of the commandments for the benefit of the believer who seeks to lead a godly life.” (pg. xiii) Should that not be the goal for all growing believers? Next, the value of the Larger Catechism is found in its presentation of the doctrine of the church, as developed by the author of this introduction. He correctly points out that such a presentation is entirely absent from the Shorter Catechism, except in an inference to the persons of baptism. And last, the value of this Larger Catechism, according to Dr. Godfrey, is that it is a full, balanced, edifying summary of the Christian faith, a worthy aid as we grow in a knowledge of God’s truth. I can do no less than recommend the Commentary on the Westminster Larger Catechism, as authored by Johannes G. Vos, edited by G. I. Williamson, and published by Presbyterian and Reformed Publishing House. It has been my constant companion in my pastoral and personal devotions. Yes, the Larger Catechism has language problems in that it is fixed in sixteenth century language. Certainly, we have had no problem in translating inspired Holy Scripture into the language of the twentieth century, with versions such as the New American Standard Bible. Why isn’t there a movement to do the same with the language of the Westminster Confessional Standards? Fellow elders, we need overtures to our respective presbyteries and General Assemblies to bring the Westminster Confession Standards up-to-date in their language! My plea to our readers is to rediscover the Larger Catechism of the Westminster Standards. You will find it to be all that Professor Godfrey says it is. And it will be to you, as a mature Christian, a worthy help as you worship and serve the Lord God from day to day. For our teaching elders, the Larger Catechism will be a help as you instruct the people of God in the Reformed Faith from Lord’s Day to Lord’s Day.